If you are on Hosur road going towards Electronic city in the evenings and not taking the elevated flyover, chances are you are going to be stuck at the Gaarvebhavipalya junction. The usual sights and sounds of traffic chaos strike you loud and clear. You will also see a bunch of young women balancing plastic pots while waiting for a safe moment to cross the busy junction. These young women cross over the busy and often dangerous highway, from Hongasandra side to Bandepalya to collect water every other day. Water is the biggest concern in sitting MLA Sathish Reddy’s backyard – Bommanahalli. Sathish Reddy, a first-time MLA from BJP, on the face of it, has earned a lot of goodwill from the ‘vote bank.’ He is the go-to person for all the neighbourhood troubles – be it property dispute, neighbours’ brawl, water issue or getting a ration card. He is even known to arrange transport and subsidise the whole travel to Melmaravathur temple, a popular pilgrim centre in Tamil Nadu for the local women at least twice a year. Though the Corporator Manjunath Reddy B S is from BJP, Sathish Reddy is the man everybody prefers to go to. The MLA has the reputation for being very approachable, irrespective of the constituents’ social or economic background. The constituency is a mix of high income and low income families, with high rises, independent villas and low income housing. He started the Jana Spandana programme about three years ago where he met the local RWA representatives along with civic authorities and heard grievances. Brigadier Murthy, a senior citizen from from HSR Layout says of Sathish Reddy "He is capable, very approachable and when we tell him our problems he listens. He also gives precise instructions to the authorities on what needs to be done to fix the problems." Murthy however echoes the sentiments of lakhs of Bommanahalli residents when he says "But nothing changes. The problems remain as they are." Murthy checks off the problems that plague HSR Layout, one of the biggest layouts in the city. Better roads, reliable water supply, garbage management, better bus facilities and clearing of encroachments are the top demands from HSR Layout. According to Murthy, this charter of demands was handed over to the MLA, early in his tenure. But four years later, the problems remain. The demand for a bus stop in fact has not been acknowledged at all. Murthy says "The Comprehensive Development Plan (CDP) 2015, has no mention of a bus stop." On the other side of the highway, Bommanahalli and Hongasandra have similar problems. The Bommanahalli traffic junction is a mayhem on most days, largely due to the haphazard stopping of buses – both BMTC and inter-state. Pedestrians put themselves in the harm’s way on a daily basis while attempting to catch a bus or just crossing the road. Pedestrian casualty is a common occurrence. Satish Reddy has been vocal in opposing the appointment of BBMP ward committees. While ward committee is more of a city issue, the MLA has made it very clear that he doesn’t like it. Reasons behind this remain unsaid, but from considering the clout the MLA wields in the constituency, it is not hard to guess that divestment of power does not exactly work in his favour. Amudha P, 45, lost her husband to a speeding taxi at the very same junction. The MLA has been pushing hard for an elevated road over the Madiwala lake to connect Bannerghatta road to Hosur road but has not demanded for a bus stand near Bommanahalli that could save so many precious lives, not to mention precious time for the commuters. 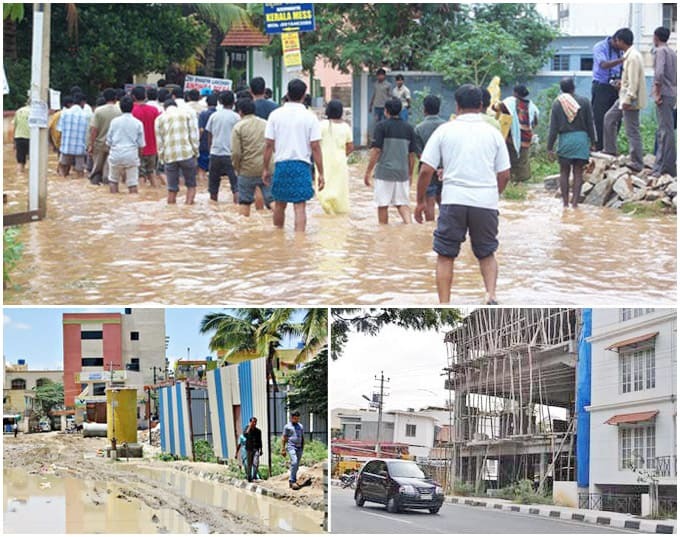 The other big concern in the area has been encroachment of Rajakaluve or the storm water drains (SWD). Every monsoon, residents in the vicinity start praying to the rain gods to not bless them. Heavy rains mean overflowing lakes and flooded homes. Encroached SWDs are the sole cause for these floods. Memories of the 2006 flood are still fresh in Shantha’s mind. She is a 38-year-old domestic worker from Hongasandra. "I had to send away my little kids because it wasn’t safe. I lost everything in that flood." The clearing of encroachment and covering of SWD is a job that has been taken up earnestly only in the past year. But the progress has been very slow. The residents worry that the change of government might come in the way of finishing the work before the monsoons. Garbage management has been an issue in this constituency as much as in the city and no special efforts were visible from the MLA to fix the problem. Water however remains the biggest concern. Majority of the low income households do not have a legal water connection. A BWSSB official on conditions of anonymity said, "There are a lot of illegal connections, but because the MLA is under pressure to provide water, we have to look the other way." A few months ago, BWSSB officials did undertake disconnection of illegal water connections. But once the officials left, residents quickly put their own pipes. Jeevan, 30-year-old construction worker from Bandepalya says, "I live here on rent; the owner is unwilling to pay for legalising this connection. If this is also not there, then I have to rely on tanker water and pay so much more." The more affluent apartments and house owners either have borewells or rely on tankers for the water supply. Even those with the Cauvery connection don’t have a reliable water supply. Bommanahalli constituency comprises HSR Layout, Bommanahalli, Hongasandra, Jaraganahalli, Bilekahalli, Mangammanapalya, Singasandra, Arakere and Puttenahalli. Despite being a likeable and approachable MLA, this election will be a tough test for Reddy, considering the overall anti-incumbency factor against the state government and lack of any real progress on the ground. Madhusudan Reddy, President of Rajarajeshwari Nivas apartments in Hongasandra says, "We believed that he can work for the progress of this area. He showed a lot of promise. But today, nothing has changed." The only other candidate who can put up a real fight seems to be Dr Ashwin Mahesh of the Loksatta party. Apart from Reddy, Mahesh has been the only other candidate who has reached out to the people in the campaign period. Although his reach seems to be better with the literate population than with the illiterate population. 20-year-old Keerthi, a garment factory worker, who campaigns for the BJP says, "We keep seeing whistle party guys (Loksatta), but we don’t know the candidate." Mahesh has made it clear that clean politics with emphasis on development and people participation is the way forward. This is an idea that a lot of educated voters, relate to. Murthy is one such voter. But he is also practical. He says, "Ashwin is very capable. He has a vision. But let us say he wins, and BJP forms the government somehow, will they let him function properly?" He brings up the age-old question – whether to vote for a party or a capable individual. Congress candidate Nagabhushan C, though is seen, no one knows much about him. Rumour has it that he has been propped up by Kupendra Reddy, a Congress member who lost to Sathish Reddy in the last elections. 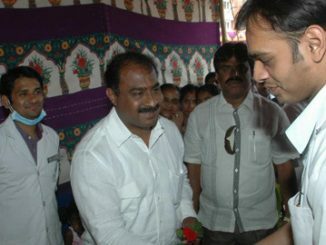 Kupendra Reddy was one among the richest candidates in the 2008 elections. There are seven other candidates in the fray, including software engineer-turned-activist Yogesh Devaraj who is contesting as an Indiependent. Though they have been campaigning they haven’t left much of an impact on the voters. No election campaign is free from cash transactions. If one goes by the word around the area, it seems that Congress is the biggest spender in this constituency. However this reporter has not been able to verify these claims. There were 2,61,085 voters in 2008 elections, out of which only 46% voted. Satish Reddy secured 62993 votes and defeated Kupendra Reddy of Congress with a margin of 13640 votes. This time the revised electoral list has 319,971 voters. Newly elected MLA of Jayanagar B N Vijaya Kumar meets residents. Vote for national parties only. We have to choose between congress (death) and BJP(devil). Votes to any another party is like wasting voter’s mandate .if really we want all round development , we shouldn’t waste our mandate and only choose national parties . Choose between devil and death no other option left…..
Citizenmatters – Why are details of Yogesh Devaraj not published? There are 100s and 1000s of ppl who have committed to vote for Yogesh Devaraj after our door-to-door campaign and interactions. What will they think about you being unfair to their candidate – A citizen candidate. And you call your website, citienmatters. The reason can’t be not having the details since your team spoke to Yogesh for 45+ mins. Please provide these inputs in the article ASAP and send a link to yogesh4mla@gmail.com. No need of publishing this comment.